20 volunteers assembled on July 20, 2001 with one mission in mind, to provide the ultimate Jamboree Broadcast experience for over 40,000 Scouts and Scouters. Our ten days of the most fun at the Jamboree are drawing to a close. QBSA will leave the air at 3 pm on Tuesday 7/31/2001. But have no fear, we will return for the Jamboree in 2005. If we are able to improve as much for 2005 as we did for 2001, all I can say is LOOK OUT JAMBOREE! This years experience has been such a fun time for all of us, making new friends, renewing old friendships, telling stories (both tall and short), and giving scouts a wonderful experience. We have all been invited to return for 2005, it is our hope that we all can do that. This site will continue to be a work in progress for the duration of the Jamboree. There are many more photographs that I have to post, but I will put them online when I get back to work later this week and have access to a high speed internet connection. 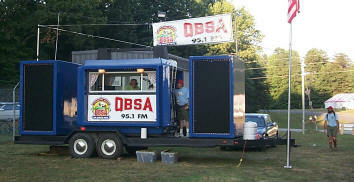 QBSA is now on the air, broadcasting from our Boom box on Thomas Road at the entrance to the Arena. We have not been able to stream audio over the internet as we had hoped to do, due to rights issues.